“state sovereignty is not just an end in itself: Rather, federalism secures to citizens the liberties that derive from the diffusion of sovereign power.” New York v. United States, 505 U.S. 144, 181 (1992) . . . Because the police power is controlled by 50 different States instead of one national sovereign, the facets of governing that touch on citizens’ daily lives are normally administered by smaller governments closer to the governed. The Framers thus ensured that powers which “in the ordinary course of affairs, concern the lives, liberties, and properties of the people” were held by governments more local and more accountable than a distant federal bureaucracy. The Federalist No. 45, at 293 (J. Madison). The independent power of the States also serves as a check on the power of the Federal government: “By denying any one government complete jurisdiction over all the concerns of public life, federalism protects the liberty of the individual from arbitrary power.” Bond v. United States, 131 S. Ct. 2355, 2364 (2011). But in Utah, for example, where over 66 percent of the land is claimed by the federal government, unelected federal bureaucrats exercise police power over far more of Utah than the governor, state legislators, and county commissioners do. Citizens of Utah are routinely entangled in vast federal bureaucracies when it comes to issues that “in the ordinary course of affairs” concern their “lives, liberties, and properties.” They must deal with the Bureau of Land Management, the National Forest Service, the EPA, and a host of other federal bureaus, agencies, etc.. Routine local land-management issues quite literally become federal cases. One government — the federal government — has complete jurisdiction over all the concerns of public life in over 66 percent of the state, exposing Utah citizens to solidified “arbitrary power” in a way that no citizen of New York State, for example, ever encounters. There the federal government claims less than one quarter of 1 percent of the land, and New Yorkers can deal with elected local officials to solve the vast majority of their problems. Just ask the citizens of San Juan County, Utah, who have had their homes raided by heavily armed Bureau of Land Management agents and have seen one of their county commissioners prosecuted and sentenced to ten days in prison and fined $96,000.00 for riding an all-terrain vehicle on a county water-line-maintenance road that had been unilaterally closed down by the feds. A county sheriff in New York who raided homes or arrested a county commissioner would quickly be voted out of office. The citizens of San Juan County have no such recourse. Instead of exercising their political franchise to protect their “lives, liberties and properties,” they must fight the full weight and unlimited resources of the federal government. Or consider the ability to self-govern, the cornerstone of citizenship. The Supreme Court has described the ability to tax as a necessary sovereign right of each state. And property taxes are the primary tax on which local governments depend. But Nevada is deprived of the ability to tax over 83 percent of the land within its borders. Even worse, Nye County, Nev., cannot tax the 92 percent of its land that is claimed by the federal government. Just imagine trying to fund roads, schools, libraries, police departments, fire departments, and parks-and-recreation departments on taxes generated by less than 8 percent of the land within your county. The federal government explicitly recognized this inequity in 1976 when it passed the Federal Land Policy and Management Act. To try to compensate local governments, a sort of federal welfare program, Payment in Lieu of Taxes (PILT), was established. But PILT payments are a poor substitute for property taxes. First, PILT payments are insufficient. They pay local governments far less than what property taxes would bring in. For example, Kane County, Utah, generates much more revenue from taxing the less than 8 percent of privately owned land within its borders than it receives in PILT payments on the more than 90 percent of its land claimed by the federal government. Second, PILT payments are uncertain because eastern-state delegations routinely prevent Congress from issuing the payments, in order to pressure western delegations on pending votes. Third, governments of western states cannot spend PILT dollars the way eastern states spend tax dollars, because policy on how PILT payments can be spent is set by the federal government, not local citizens. In short, PILT payments make local governments in the west dependent on and beholden to the federal government, unlike local governments in the east, which are free to raise and spend taxes as they see fit. As a result, westerners are denied an essential right enjoyed by citizens in the east: the right to self-govern. They are also denied certain opportunities to get ahead in life. Eastern states routinely take land for public improvements designed to generate jobs, industry, and commerce. But western states cannot condemn federally claimed land for public improvements. Imagine trying to build a road, power line, broadband system, or telecommunications system in a state where you can’t throw a stone without running into federally claimed land. It is just not possible. Idaho recently embarked on a project to deliver additional electrical power to the state. Owing to the state’s inability to condemn federal land (over 61 percent of the state), the path of the power line had to tack jaggedly back and forth across the state. The additional length of the power line taken up in avoiding federal land reduced by two thirds the power that the project could deliver. Try creating jobs, industry, and commerce with inadequate electricity. This would have never happened in New York, where the state would simply have condemned the lands that lie in the most efficient and effective path. Let’s consider the cumulative impact that the denial of all these rights have on westerners: the denial of equal political power. Imagine trying to convince your adult children to stay in a town they know cannot provide a thriving economy or even the basic amenities of life, such as electrical power, good roads, cell service, and broadband. Imagine attracting new people to a state without the ability to determine its own future — a state dependent on the debt-burdened federal government for welfare checks to try to survive. Impoverished western counties dominated by federally claimed land are exporting children and importing poverty. Their population does not grow. And how is political power at the federal level shared among the states? Congressional seats and Electoral College votes are allocated on the basis of population according to the Census. Population is the constitutional currency in the competition among the states for political power. And western states are deprived of that currency because they have been deprived of all the sovereign rights discussed above. As a result, the federal government was barred from purchasing land within a state without the consent of the state legislature. That protection is included in Article I, section 8, clause 17, now known as the enclave clause. However, western states have never been given dominion over the land within their borders, and the result that Mr. Gerry feared has been achieved. Western states and their citizens are not equal. Contrary to the intent of the Framers, they are awed “into an undue obedience” to the federal government. The right to have routine matters involving their lives, liberties, and properties determined by local officials whom they elect and can vote out of office. The right to self-determination. The equal right to raise taxes to pay for roads, schools, libraries, police departments, fire departments, and parks-and-recreation departments. The right of local government to create a strong economy. And, finally, the right to be represented in the halls of Congress equally with the citizens of the 38 states not dominated by the federal government. Equality is not an extreme idea. It is the basis on which our nation was founded. In a long, unbroken line of cases extending from 1845 to the present day, the Supreme Court has consistently held that the Constitution demands equality with respect to the sovereign rights of states. All of the rights discussed above have been recognized by the Supreme Court as sovereign state rights. Their denial in some states results in the unequal treatment of the citizens of those states. not only do States retain sovereignty under the Constitution, there is also a “fundamental principle of equal sovereignty” among the States. Over a hundred years ago, this Court explained that our Nation “was and is a union of States, equal in power, dignity and authority.” Coyle v. Smith, 221 U. S. 559, 567 (1911). Indeed, “the constitutional equality of the States is essential to the harmonious operation of the scheme upon which the Republic was organized.” The fundamental principle of equal sovereignty remains highly pertinent in assessing subsequent disparate treatment of States. Id., at 580. Today, twelve western states are being treated disparately on issues relating to their sovereignty. Millions of citizens are denied equal rights, rights enjoyed by citizens of eastern states. It is a result that the Constitution does not allow. It is wrong for for eastern politicians and federal agencies in D.C. to continue to dismiss this issue. It is time for a reasoned discussion about the denial of equal rights for citizens of western states — and about how to correct the disparity. — George R. Wentz Jr. is a lawyer with the Davillier Law Group in New Orleans. John W. Howard is a constitutional scholar and litigator in San Diego. 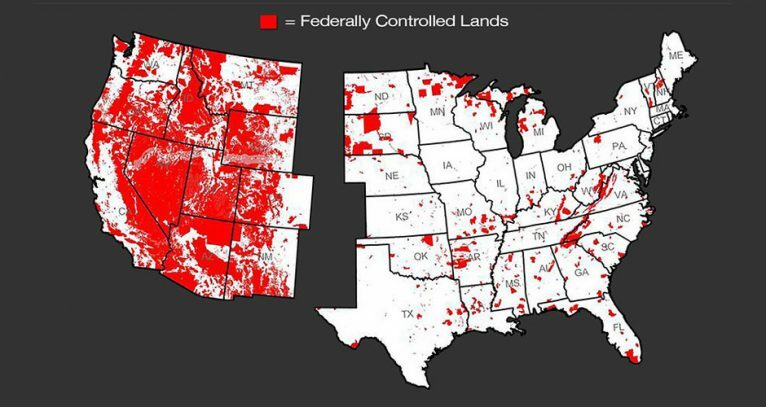 Is the GOP ready to transfer federal lands to the states?